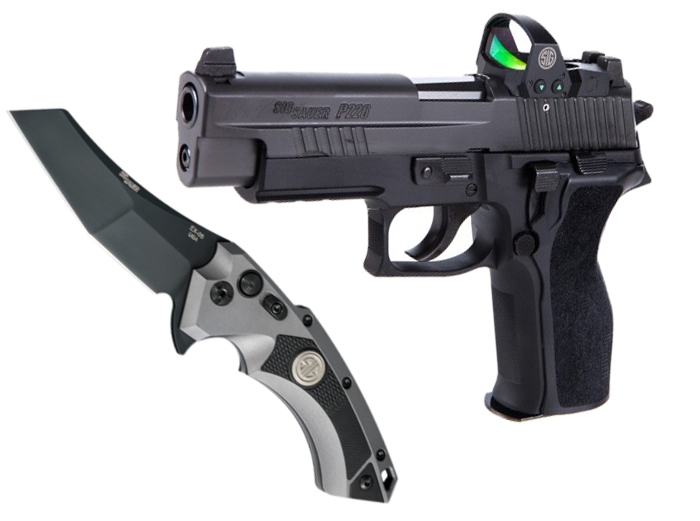 **** Chosen by Winner: John S.
The SIG P226 RX Full-Size 9mm ($1440) is the pistol that set the standard by which all other combat handguns are measured. Designed as SIG's entrant in the military trials to replace the 1911, today the P226 is in use by the U.S. Navy SEALs, Federal agents, and numerous law enforcement agencies including the Texas Rangers, Ohio State Highway Patrol and the Michigan State Police to name a few. The slide-mounted reflex optic, the ROMEO1, ensures faster sight acquisition on target and the exceptional ergonomics and balance make this full-size pistol easy to handle. The included SIG ROMEO1 red dot sight features a molded glass aspheric lens with high performance coatings for superior light transmittance and zero distortion. Manual illumination controls remember your last used settings. Three MOA Red-Dot with multiple intensity settings ensures rapid target engagement under a full range of lighting conditions. The readily available CR1632 battery is top-loading, allowing for quick battery replacement without having to remove the sight from the firearm. Extremely strong and lightweight aircraft grade CNC Magnesium housing ensuring a lifetime of reliable service. Dependable waterproof (IPX-7 rated for complete immersion up to 1 meter) and fog-proof performance. The distinctive X5 SIG 4" Wharncliffe flipper ($269.95) from Hogue offers effortless opening action without the aid of a spring. Utilizing Hogue's state of the art deployment technology, the blade rockets into open position and locks firmly in place. A sliding safety adds an extra level of blade security when in the open position. This Allen Elishewitz design provides easy one-handed opening and closing and a comfortably contoured handle. Item includes an ergonomic pocket clip, that is reversible for left or right-hand carry.